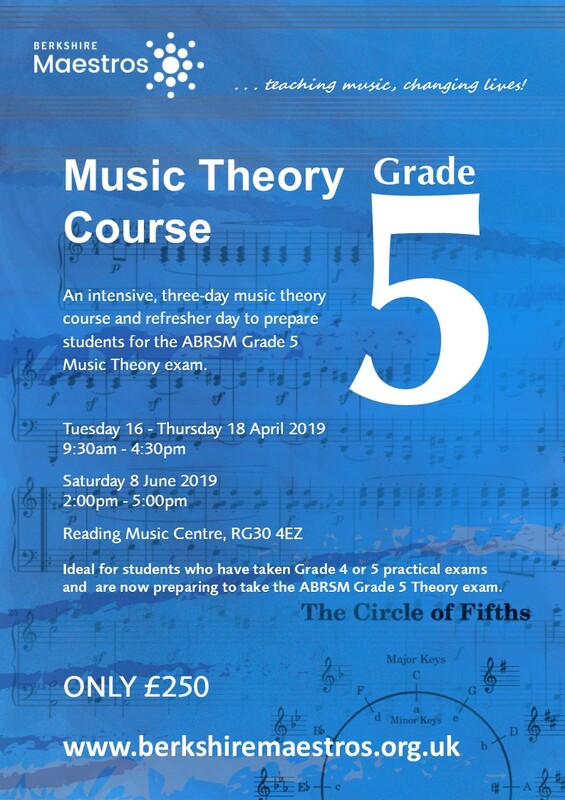 Berkshire Maestros is delighted to introduce an intensive three-day music theory course to prepare students for the ABRSM Grade 5 Music Theory exam. The course is aimed at young people of secondary school age* who need to pass Grade 5 Theory ahead of their Grade 6+ practical, or students wanting to enhance their theoretical knowledge in preparation for GCSE Music. Students enrolling for this course must be at least Grade 3 standard on their chosen instrument/voice. The course is open to all students across the county (even if you are not already a Maestros' student) and will be led by Maestros' teacher Benjamin Copeman. This is a perfect opportunity for students who have taken their Grade 4 or Grade 5 practical exam and now have to take Grade 5 Music Theory to be able to progress onto Grade 6. Students will be required to attend all three days of the course, starting at 9:30am and finishing at 4:30pm. Included in the price is also a refresher day on Saturday 8 June 2:00pm-5:00pm. The price of the course is excellent value at only £250.00. For full details and to enrol please see our website here. * Children in years 5 and 6 will be accepted onto the course at the discretion of their instrumental teacher.